Following Jesus’ death, the first acts of the apostles were simple. The diverse group of Israelites lacking positions of power, seminary training or connections to the Roman Empire gathered together in an ordinary upper room, following their directive from Jesus to go to Jerusalem and wait. There, the modest, nondescript group worshiped, fellowshipped and prayed. Ornate buildings and religious traditions paled in comparison to their newfound outbound mission. Some two thousand years later, a similarly varied group of Christ followers gathered in a lower room; the basement of Christ UMC in Jersey City. On January 4, faithful church members took seats around a table and were joined by their pastor, Rev. Ivan Alberts, Gateway North District Superintendent Manuel Sardinas and Bishop John Schol. Collectively, the group decided it was time to get back to the roots of their faith and emphasize the making of disciples for the transformation of the community. Some of the congregants had been members for two years, others four, others 20, and for one, 45 years. They agreed that their elaborate church building which stood as a striking but obsolescent edifice in the heart of the city was struggling in a state of physical and fiscal disrepair, had served the body of Christ well through the years and had lived out its life. With the church’s decreasing numbers, mounting debt, and financial struggles, the small group of forward-thinking hopeful disciples held strongly to the idea that they had been called for “such a time as this” to be the ones chosen to change their city for Christ. For some, it was thrilling, for others, uncertain, for all, an uncomfortable dance with anxiety. But in the midst of tense conversation, a vibrant boldness to step outside the familiar for the purpose of a greater mission shown through. “The time has come for us to trust God and take bold steps of faith,” said Alberts. The congregation had come to a decision to tear down their church building, work with a developer to construct a new facility on the property and create a new, modern, multipurpose space for the congregation which would include a place of worship, daycare and programming space for mission. Bishop Schol expressed gratitude for Alberts, the church members and pastors within GNJ willing to take risks. “Church today is very different,” said Schol, “but your courage and vision to try something new is inspiring.” Remarkably, that ‘something new’ harkened back to something old; the original mission of the first apostles. “The first temples ever built were within marketplaces, and they had many sections,” said Schol. “They were built in the midst of their communities to engage in conversation through experiential and ecumenical cooperation and collaboration.” Alberts nodded in agreement and proclaimed to the group that the vision for the future of their church was that of their faith’s past and that buildings constructed long ago don’t necessarily meet the present community’s ministry needs. With Christ UMC beyond the capacity to take care of, Alberts and Schol explained that they were standing on a treasure. “How are United Methodists going to uncover it?” asked Schol. GNJ Property Manager Alex Mayer addressed the group. Church members gathered around the table each wrote down what was most important to them regarding Christ UMC and their witness in Jersey City. In the midst of varied thoughts, ideas and opinions, the group collectively settled on missional outreach, financial stability, and continuous growth as top priorities. “We need to take into consideration the population change here in the city and offer a worship space for new generations,” one churchgoer said. Another suggested investing in music, drama and multimedia for the new facility to create a bright, vibrant and exciting worship experience. Conceding that traditional ways of church funding are in decline, the group began a discussion about engaging efforts to become entrepreneurial for sustainability; acknowledging their valuable real estate and the bold, God-sized vision before them. The mixed-use structure that will stand in the footprint of Christ UMC will feature affordable senior housing, office space, potential residential and or commercial space, and church space for the existing congregation to further their mission and ministry to reach their city for Christ. “Our job is to negotiate the best deal for the church and make a place that’s attractive to the community, that’s useful and purposeful,” said Schol, emphasizing that the church will have final approval of the space. Jersey City exemplifies the changes many GNJ churches are facing. Decreasing budgets and declining worship pose tough challenges and yet regenerative opportunities for churches throughout the conference. 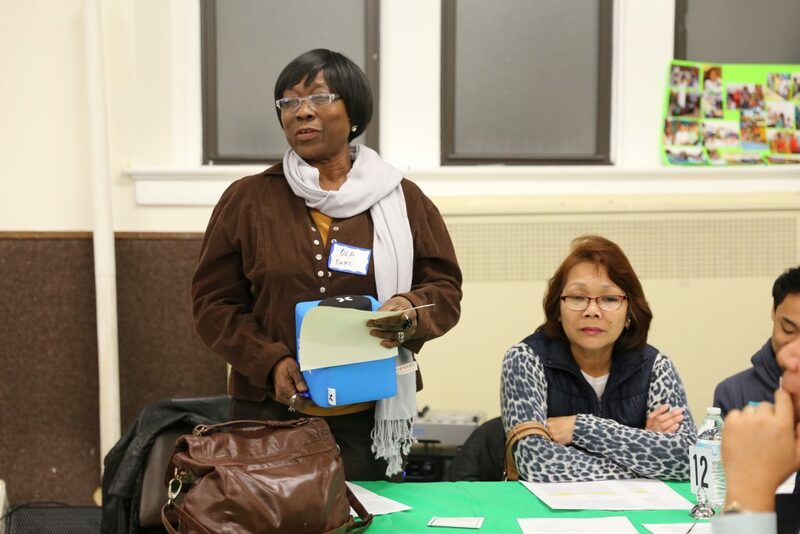 Ready to embrace change, Christ UMC invited Jersey City’s five other United Methodist churches to their basement gathering with hopes of working together in a collective effort to stay afloat by grappling with their stark realities. 70 clergy and laity from Christ UMC, Bethany Browne Memorial, Clair Memorial, Church of the Covenant, First Filipino-American and Trinity UMC’s assembled to examine possibilities. “The past has served us well, but we need to step out in faith to find new ways to cooperate and work together in consensus around a common mission,” said Alberts. Using information collected by the churches, Mayer presented a PowerPoint recognizing the serious challenges facing the congregations that jeopardize the mission and witness in Jersey City; projecting fewer than 200 United Methodist worshipers and more than $1 million of debt in the next five years, indicating unsustainability. “This is no one’s fault but a condition of the forces outside the church and the challenge for congregations to make quicker decisions to address current realities,” stated Schol. With significantly deferred maintenance in several of the buildings, the forecast for the future of these churches as a whole is challenging. But, following the lead of Christ UMC, there is also opportunity for those willing to loosen their grip on nostalgic tradition and take leaps of faith. Church members voiced their thoughts, concerns, fears and opinions, asking questions and floating ideas of strengthening basic cooperative ministries and the potential of coming together to share certain aspects of church such a conjoined confirmation class to provide a better experience for youth. “What are ministries we’re already doing that can be strengthened in this way?” asked Alberts. Worship, young adults, evangelism, after-school tutoring programs, firming up the administrative work of the congregations and community service work through joint Hope Centers were ideas mentioned as ways the churches could partner to lower costs and provide better quality services and ministries. Bearing witness to the benefits of collaboration, Emanuel UMC in Union City avoided closure by joining forces with Lafayette UMC in Jersey City. The result was a bolstered feeding ministry and a strengthened congregation and community witness. In Monmouth County, Ballard UMC, Hamilton UMC, Wall UMC, and First UMC in Oakhurst joined forces to serve their community by creating an outreach to find, feed, and aid homeless individuals, boosting their witness as United Methodists in the community. “Staff and clergy can work together to provide collaborative approaches to ministry in their community by using each other’s gifts and talents in specific areas, lending their skills and working together to share in ministry experiences to strengthen all of the churches,” Schol stated. He indicated that church members will find disagreements but, like the first apostles should agree on the central mission of Christ. With Christ UMC already committed to moving forward, Bethany Browne and Covenant UMC’s began conversations about the potential of repurposing property that could better serve the community and provide sustainable ministry and worship space for the long-term future. Despite demonstrating varying degrees of vulnerability, the Jersey City churches remain important to GNJ as the city is on a path to become the largest in the state. Raquel Rebadavia, a lay leader at Trinity UMC, praised the long-term, outbound and missional-minded vision for Jersey City and GNJ as a whole; embracing the idea of returning to the apostolic roots of Christian faith.